Kersten Gallie was killed when fire gripped the property just before Christmas. 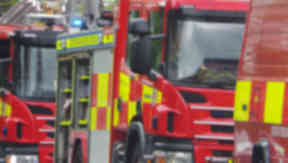 A woman who died in a home fire shortly before Christmas has been named. Kersten Gallie, 73, suffered fatal injuries in the blaze at the property in Fortingall, near Aberfeldy, on December 21 2018. A police spokesman said an investigation into the fire had now concluded. He added: "While the exact cause has not been fully determined, we are satisfied that there are no suspicious circumstances."